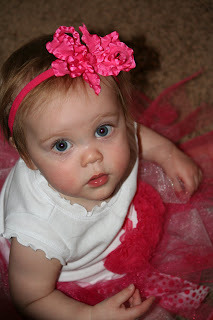 It has been too long since I last blogged...here is where I am! Where I am: For once I'm actually not on my couch, but I'm sitting in my bed. I'm about to get ready for the day & I think I'm headed to Sugar Brown's to go work on a project! I also watched the Top Chef Season Finale - not sure if any of you out there watch Top Chef, but I love the show...the only bad thing is that I would LOVE to actually taste the food! Ash Wednesday - In my last blog I mentioned that I was going to participate in the Season of Lent as I felt like God wanted me to so that I could find Him in some new ways. Last Wednesday I went to the Ash Wednesday service as Westminster Presbyterian Church, and it was BEAUTIFUL! Josh went with me, and as we left we talked about just how refreshing it was to worship God with such reverence. I LOVE my church and I love the way we worship God at COTR, but I also think it is healthy to get outside of our boxes from time to time & see Jesus in other "traditions." I've done some research on Lent and regardless of directions it has taken over the course of history, the initial reason it was implemented was to be a time of reflection leading up to Easter. It is a call to reflect on our own lives and to realize that we are sinful and in need of a Savior. On Ash Wednesday people receive ashes on their foreheads as a reminder that they came from dust & they will return to dust - in and of ourselves we are nothing - as we reflect on this for 40 days, the resurrection of our Lord & Savior is more poignant! We are joyful that thankful that He came for us! Lisa Bevere @ Momentum Conference - All I will say about this is that the Lord both spoke to me & I believe spoke through me at this conference. Lisa Bevere has been a hero in the faith for me for many years, and I was psyched to do a break-out session at a conference where she was the keynote speaker. In her opening session she mentioned that she has 5 girls that travel with her...when I started my first session, Hannah Reed, Ashlee VanDeventer, & Deneille Golden sat on the front row & whispered to me, "we are your girls!" It made me smile & realize just how blessed I am to have so many amazing young women around my life that I get to do life with! Mema Time - I was able to take my Mema to the doctor's office twice last week, and although the circumstances weren't pleasant, I so enjoyed just being in the presence of my grandmother. She is gracious, kind, and amazingly strong. We mostly talked about insignificant pieces of life, but afterwards I was just thankful that I got to be with her and help her...she is strong for so many people and has been for years, that it was nice to be strong for her. 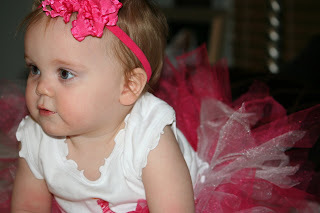 I took pictures of my niece Madison for her one-year birthday! 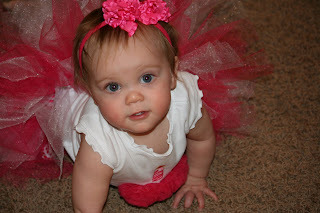 She had on the most adorable tutu...Isn't she gorgeous! During these past two weeks I also got to celebrate my friend's birthday. 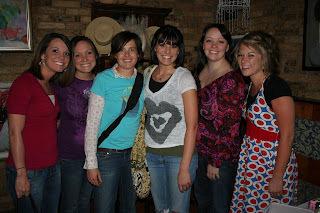 A group of us surprised her with dinner at Manna. Happy Birthday Katie! Loving the Amazing Race. It allows us to see someplace other than Lubbock:) Y'all would be a great team! And your niece IS beautiful (all of them)! Ummmm...hello!!! Seriously? Have you guys submitted your audition tape for Amazing Race?? You guys would ROCK!!!!! But make a pact upfront: *Absolutely NO meltdowns of an kind on National TV- that means no acting like a whiney girl who can't bring herself to milk a camel, and Joshua is not allowed to berate or belittle you in any sort of maniacal tyrade. Not, that we of course THINK that would happen...but those are my pet peeves when watching the show. Half the time I think the guys should leave the girls crying on the highway, the other half, I am screaming at the girls to storm off and declare they don't have to be treated that way. Oh! And no creepy matching outfits. Coodinate, yes. But matchey-matchey is cheese!! hahahaha! For reals, if I've ever known a couple who could do it- it would SO be ya'll!! Audition! Audition! Audition!! Paige, you lead a beautiful life. May you continue bringing God's light and love to those around you! !